Bombax trees in full bloom. As the season of blooming of bombax, a tree of immense beauty and stature, has set on, its target by illegal timber dealers, who fell them regularly for making profits at the cost of invaluable natural beauty and resources are on the rise in Lakhimpur district. Locally called Shimalu, the trees are being felled illegally by timber smugglers across in the riverine areas in northern Assam’s Lakhimpur district. 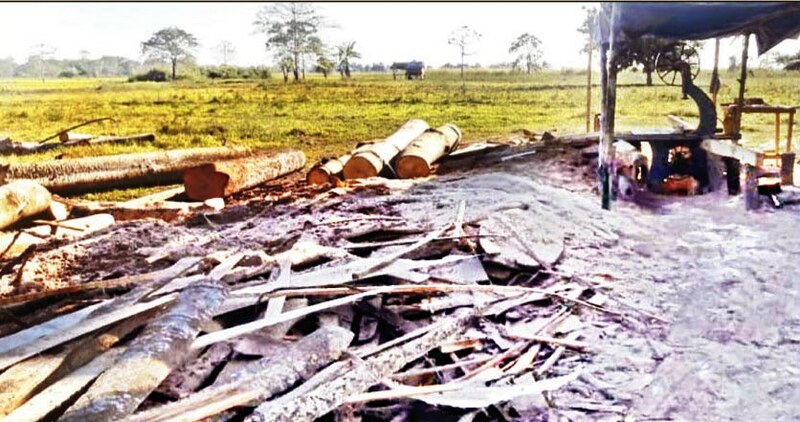 Locals alleged there has been a spurt in the illegal felling of bombax trees in the riverine areas of Subansiri in Lakhimpur and their supply to North Lakhimpur, Majuli and Jorhat in various timber forms. The river isles of Subansiri have witnessed mushrooming of illegal saw mills where bombax trees, felled in nearby areas are being cut into different forms and sizes before being transported nocturnally to various timber depots in Lakhimpur and other nearby places, said locals. “The trees are felled with the help of chain saw bars in river isles and then carried to illegal saw mills in tractors to be cut into pieces before being supplied to North Lakhimpur to the north and Majuli and Jorhat to the south on boats in the night,” said a local. Such incidents are happening in Lohit-Khabolu, East Telahi, Ghunasuti, Daflakata areas off the river Subansiri in Lakhimpur district. Inland waterways ghats like Eserakata, Khabolu, Borghat, Na-Ali, Somdirimukh are witnessing transportation of thousand cubic feet of timber of bombax trees in Lakhimpur district every night to urban areas. All these are taking place despite the presence of the district forest department and other law-enforcing agencies, alleged locals. Also known as the red-cotton tree, bombax (bombax ceiba) has a lower price in comparison to other timber in the market. But its usefulness in the construction work, mostly used as framework or shuttering has increased in recent times. The planks of bombax are sold at Rs 400 per cubic foot in the timber depots. As the earlier forest covers of the district has shrunken considerably due to rapid deforestation, the river isles and riverine areas of Lakhimpur district are the only places where some trees and wild vegetation have remained somehow. But the felling of the bombax trees in these areas has paused a threat for complete extinction of this exotic tree that also produces finest cotton used for making mattresses and bed accessories. Besides, the bombax trees are natural nesting place of various birds like greater adjutant stork (leptoptilos dubius) and other avian species. The indiscriminate felling of this tree has also disturbed the natural habitation of these birds threatening an ecological disaster in the entire region. Earlier in 2015, hundreds of bombax trees were felled to widen the PWD road from Gogamukh to Dhakuwakhona in Lakhimpur district which also affected the natural habitation of various birds. Now, at the onset of its blooming season the felling of bombaxes in Lakhimpur district has created a situation where an environmental disaster is looming large.